MAN Diesel SE was set up by a national conversion, and is registered in Augsburg, Germany. According to the SE statute, the management decided to retain the existing two-tier corporate structure and, consequently, the German form of codetermination, giving the workers 50 per cent of the seats on the supervisory board. At the same time, the management used the founding of the SE to reduce the size of the supervisory board from 12 to 10 members. This was not considered a reduction of participation at this level by IG Metall, however: only the employee seat reserved for the management staff representative was lost (according to German codetermination law this person is considered as being on the employees’ side). At the time of SE establishment MAN B&W Diesel – mainly the result of a German–Danish merger of heavy diesel machinery production in 1980 – the company employed 6,423 people, mainly in Germany (2,875) and in Denmark (2,362), but also in France, the UK and the Czech Republic, with some service departments in Greece, Norway and Sweden. 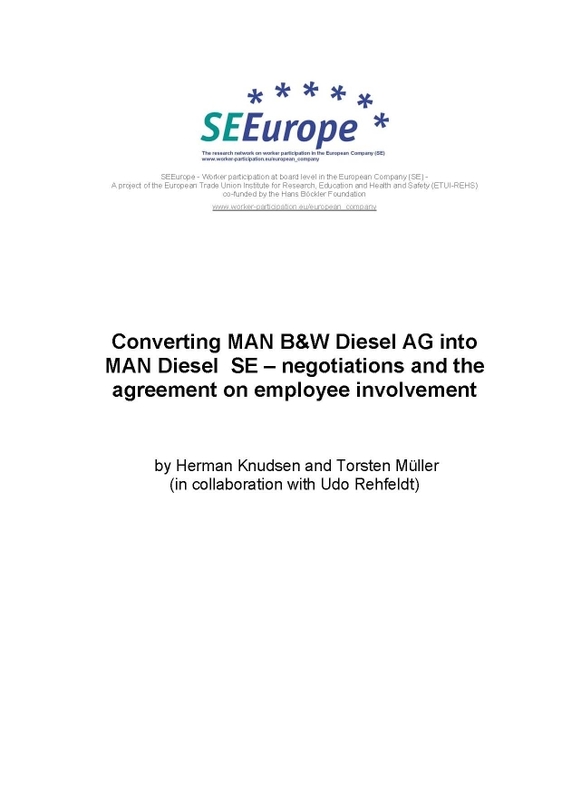 The transformation of MAN B&W Diesel into an SE may be seen as only a first step against a broader background of reorganising the company’s whole machinery and truck branch in Europe, making it a bigger, globally more competitive player. Meanwhile, negotiations have commenced with the workers as the company has decided to convert into an SE wholesale (Oct 2008). Although the outcome was received positively by the workers’ national representatives, in the course of the negotiations a number of difficulties arose, caused by the different standpoints and backgrounds of the employee representatives. These difficulties concerned the character and consequences of the particular form of foundation and the location of the company’s registered seat in Germany, and the understanding of board-level participation, particularly between representatives of the two strong legal systems involved, the German and the Danish.